Russia has long had a reputation as a nation plagued by alcohol and drug abuse. What measures should be taken to deal with these problems? Citizens in the Siberian capital of Novosibirsk took advantage of an event marking the International Day Against Drug Abuse to voice their opinions. Could you live a month entirely without alcohol, cigarettes, or any other toxic substances? This was the challenge presented recently by “We Are Independent!”, a joint initiative launched earlier this year by a number of organizations in Novosibirsk with the aim of promoting a healthy way of life and a commitment to sobriety. The initiative, headed by local social program Authority and assisted financially by the regional government, rewarded participating citizens with the chance to be included in a prize drawing and, pending a clean medical test for toxins, to win a Subaru Impreza. 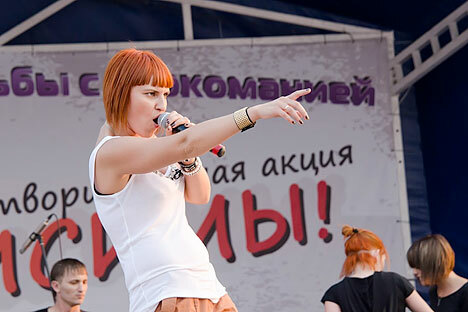 The prize giveaway on June 26 was accompanied by an open-air concert on Novosibirsk's riverfront. Although not an active participant in the challenge, I was sufficiently intrigued by the idea of the initiative to attend the concert, as well as a press conference for the event. Over the course of the day, I heard citizens from all walks of life offer a variety of differing opinions on how to deal with the problem of substance abuse. Yet however differently citizens viewed the solution, all were in agreement as to the momentous scale of the problem. Two recent reports from the UN illustrate clearly the challenges that Russia faces. Doubtless these staggering statistics were familiar to many of those who attended the morning press conference marking the final day of the “We Are Independent!” initiative. Representatives from local charities were joined by celebrities and everyone was invited to comment on the importance of the initiative, and its relevance in promoting a healthy way of life to local citizens. First to speak was Nikolai Kozlov from the organization “sport – art – mind.” He spoke of the need to provide children with a sense of purpose at an early age, saying “through sporting events we can save the young.” Local singer Mikhail Arkhipov agreed, calling on the local government to dedicate greater means to cultural programs such as Kozlov's. Andrey Grizli, a famous Muscovite pop singer called in to headline the evening's concert, spoke of the sometimes corrupting influence of popular culture. He made reference to Hollywood films, where the “essence of cool” is “embodied in the tough whiskey-drinking cigar-smoking hero.” Grizli's solution is to fight fire with fire: “Through my art I try to cultivate an opposing 'essence of cool', making the rejection of an unhealthy life into a heroic struggle,” he said. A few minutes earlier another speaker, opera singer Karen Movcecyan, declared: “society is finally over the idea that substance abuse is cool.” Perhaps Movcecyan should have listened to more popular music before making such claims; a cursory glance at contemporary pop culture proves that Grizli's argument, however messianic in tone, was far more convincing. At the concert later that evening, ordinary citizens shared their ideas for battling the ill effects of alcohol and drug dependency. Many more convincing arguments were put forward. Unfortunately Svetlana and Alexei belonged to the small number of the 1,500 registered participants who turned up for the concert. Furthermore, a disproportionate number of those attending were volunteers from local charities. Although the event provided a great platform for people like Svetlana and Alexei to exchange their ideas, there was an atmosphere of preaching to the converted. The main failings of the event were ideological. The event, designed to promote a healthy way of life, was sponsored by fast food chain “Cinnabon,” which demonstrated a questionable commitment to consistency. And worst of all, Girzli's challenge to “cultivate a new essence of cool” was poorly met. The concert featured out-of-tune pop singers performing out-of-date songs, unremarkable dance groups, guest speakers delivering nationalist rants, and even a tenor singing the national anthem. Not cool. Given the impossibility of knowing how many of the 1,500 participants succeeded in their month of sobriety, it is difficult to determine the overall success of the initiative. Yet at the very least, the life of one participant was certainly improved; Denis Tyryshkin, having passed the medical test, was declared the winner of a band new car. I later found out that while Tyryshkin had spent much of his youth battling alcoholism, he has been free from this dependency for the last four years. Thus whatever the shortcomings of the concert, the fact that those involved with “We Are Independent” so generously rewarded this man for his conduct sends a powerful message that society does care about the health of its members. Throughout the day there were many promising signs that Russian society is really committed to the task of sobering up; but to what extent does the government share this commitment? In 2009 then-President Dmitry Medvedev condemned alcohol and drug abuse as a “national calamity” and ordered his ministers to find new ways of struggling with these vices. New anti-alcohol advertising campaigns were launched and new rehabilitation centers were set up. Prices were raised and new laws introduced that curtailed the sale of hard alcohol at night. More recently, in Moscow, the night-time ban has been extended to all alcoholic drinks. While it is undoubtedly a positive sign that the government is taking action on these problems, the effectiveness of some of the proposed measures is questionable. First, it is difficult to understand how prices could have been raised when, at least in every Russian city I have visited, it is still possible to buy a bottle of vodka for $3. Besides which, the government should be careful not to repeat the mistakes of the mid-1980s. Although Soviet leader Mikhail Gorbachev's zealous crusade against alcohol producers did dramatically decrease the level of alcohol consumption, it is unclear at what price this reduction came; by raising prices too high, the policy unintentionally stimulated the production and consumption of illegally homemade and often highly toxic moonshine with disastrous effects on public health. Indeed, any measure introduced by central government diktat will be of limited effectiveness; such measures almost always fail to get at the root of the problem. So it was very encouraging to hear from Shazhin that the government, by making more money available for initiatives like “We Are Independent” and for charitable organizations like “The Motherland without Drugs,” is starting to show a more mature approach. However the superiority of this approach in theory is undermined by the reality on the ground. According to Shazhin and other charity workers, what the local government gives with one hand it sometimes takes away with the other in the form of financial resources or an insistence on taking some control of the organizations it supports. While civil society continues to work tirelessly and effectively to combat alcohol and drug dependency, government at both the regional and national levels still has much work to do in listening to its citizens and providing the necessary support. Meanwhile cases like that of Alexei Komonov continue to provide living testimony to the importance of battling substance abuse in whatever form it takes. One of the most vivid memories I took back with me from my recent trip to Novosibirsk was a photograph that Alexei, after crediting local charity volunteers with having saved his life, presented me with great pride. It was a photograph of his 11 year-old son.